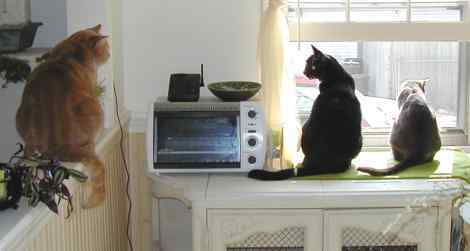 Christine and Ed write, "Having adopted Bernard a year and a half ago, Firefly almost one year ago and Amelie last September, things are busy around here with 3 Kitty Angels. Bernard is still King of the household but Firefly certain believes she is queen. She is also better know as trouble because if it is there to be found, she will and cause as much as possible too. She loves playing with cords, toilet paper, paper towels, bags, cabinet doors - basically anything that she can move. "Amelie is still very shy although she actually allows us to pet her when she is very sleepy. Otherwise now she will sit close by but one slight move and she takes off. However, the wrestling matches she has with Bernard and the games of tag with Firefly have provided hours of entertainment. Amelie certain hold her own. It is great having all three and they are a delight to have in the home. Amelie is the little mostly white cat who ate her food from under the hutch when she first lived with us. Bernard is the big boy in the middle. You can tell Firefly by her tail (names courtesy of Kitty Angels). "Thanks Kitty Angels - once we have a house, we'll be back for more." EJ, Jim and Jeff write, "We adopted six-year old Buttercup ("Butter") in late March 2003 and wanted to let you know how great things are going. Our family couldn't have asked for a more loving and affectionate pet. Thank you to everyone in the Kitty Angels family for the great work you did in caring for Buttercup and bringing us together. She adjusted very fast, and was soon exploring the house with a curious furry tail flying high. 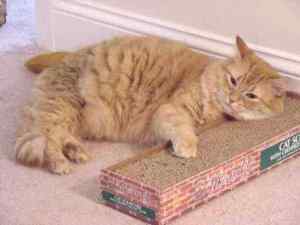 "In the kitchen she's Mommy's little helper during supper time, and as you can see from the included picture she loves her catnip cardboard scratching post. We joke that she'd make a great 'poster-kitty' for that product. 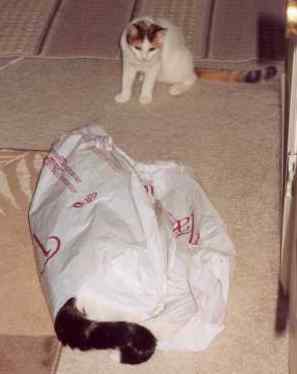 Also on several occasions she decides to run through the house meowing with a fuzzy toy ball in her mouth, looking for one of her favorite humans, then she'll deliver her 'gift' at our feet. It's the cutest thing we've ever seen. Buttercup is definitely part of the family and we're so glad she has come to trust us so quickly and appreciates her new home. Thank you again." Pam and Gary write, "We've got a match! The bond we were looking for is finally taking effect. Our resident female (Kitty), has recently taken quite a liking to Frasier. Boots, our older male is still very tolerant, but not cuddling up any time soon! Now our older cat can get some much needed R&R, Kitty can exert herself all day without wearing either cat out, Frasier is getting plenty of love, exercise AND now he has a girlfriend!" 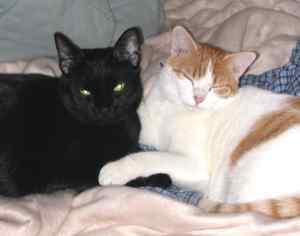 Joshua and Melissa write, "Maverick and Gunnar, (Mavy and Gunny for short), were both 6 months old when we got them from Kitty Angels in June of 2002. We were told that they were found on the streets of Boston. Both are ferals. "It is hard to believe we have had them this long already. When we first got them, Maverick and Gunnar were very skittish. It took quite some time for them to even begin to warm up to us. Nearly a year later, Maverick is still skittish at times, but almost always crawls into bed with us every night. Gunnar has made a complete 180 degree turn in his behavior. He has become VERY affectionate. We have also discovered that he has quite the vocal cords on him, as he insists on meowing loudly when hungry (which is often). "Among the funnier things Gunnar does is crawl under the blankets and hollowing out a cave to stay in. As for Maverick, his funniest trick is standing on our chests around 4:30 in the morning purring like crazy to wake us up. 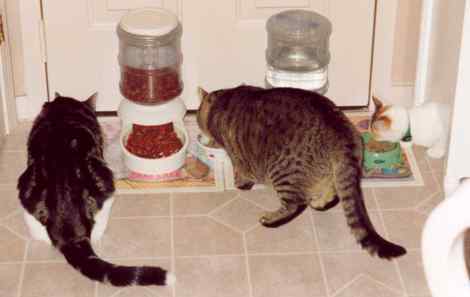 "Not a day goes by that we aren't amazed that two feral cats could have turned out to be such well behaved cats. I would encourage anyone who is unsure about getting a feral to go ahead and do so. You'll most likely be giving a second chance to a kitty who has had a rough life."